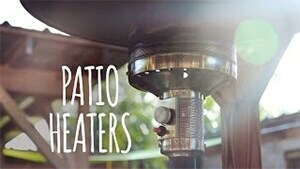 Patio Heaters are perfect for keeping your friends and family warm when the sun sets. They make it possible to enjoy your outdoor space year-round and help ensure the comfort of you and your guests! Choosing the right type of patio heater for your outdoor space will ensure you achieve your maximum warming potential. There are a lot of factors to consider when shopping for a patio heater, including the size of your space, the climate in which you live, and the level of wind. It can be overwhelming, so let our experts provide you with peace of mind! Call 877-743-2269 and take advantage of our free design services, and don't forget to check out our Best of the Best Patio Heaters and Patio Heater Inspiration Gallery. Natural Gas Patio Heaters - Natural Gas Patio Heaters are a more permanent option and produce the greatest usable output. They do not require refilling and are cleaner to run than propane. Make sure you consider the cost to install the heaters if your space is not already plumbed. Propane Patio Heaters - Propane Patio Heaters are the most portable option and generally do not need require installation. Generally, propane is the most costly fuel type and will require tank refilling. A full 20 pound cylinder will last for approximately 10 hours of heating time. Electric Patio Heaters - Electric Patio Heaters are generally the easiest to install and capable to operate without air flow. They are cheaper to operate than a propane unit and are less susceptible to wind. Electric heaters usually have lower BTUs than gas heaters so they're known to produce gentler heat. Wall & Ceiling Mount Patio Heaters - Wall & Ceiling Mount Patio Heaters are hard mounted to the wall or ceiling, allowing more space in your patio area to entertain guests. Keep in mind that these patio heaters are a more permanent option and require installation, no matter which fuel type you use. Freestanding Patio Heaters - Freestanding Patio heaters are stand-alone units that do not require installation – this makes them extremely easy to use and maintain. If you're looking for heat you can take out of the box and use today, this is your best option. Consider the fact that they will take up extra space on your patio and their heat can be affected by wind. Hanging Patio Heaters - Hanging Patio Heaters hang like a chandelier, normally above a patio table. This makes them perfect for a small space, taking up zero patio floor space. Since hanging patio heaters are typically smaller, they do not provide as much heat as the other styles and will only efficiently heat a small space. Tabletop Patio Heaters - Tabletop Patio Heaters are smaller heaters that give the appearance of an outdoor table lamp. Since they sit on top of a table, they are perfect for a small space. Tabletop patio heaters are also ready to start using as soon as you take them out of the box. Like hanging patio heaters, they do not provide an extreme amount a heat and will only efficiently heat a small space. Manufacturers often state the average heating area when describing the effectiveness of the heater. This measurement is factored based on relatively low humidity environments, with ambient temperatures between 55-70 degrees, and little to no wind. The greater the wind, the less effective the heaters will be. If constant wind is a factor where installing, you may want to consider putting up a wind break. Your heater spacing will depend on the level of protection of the area to be heated. Colder temperatures and high wind areas will require more heaters, placed closer together. What is the warranty information for the available patio heaters? To compare warranty information on our patio heaters, consult our patio heater warranty charts. For detailed warranty information, please see user manuals. If you need help deciding, call one of our patio heater experts at 1-877-743-2269!